The Alaskan Malamute is a large working dog breed that originated in Alaska. The breed is known for its strength and many owners opt for a strong name that emphasizes these physical capabilities. Samson, Dozer, Maximus, and Balboa are examples of powerful name choices. Malamutes have a double coat to keep them warm in cool climates. A few good ideas can be found by trying to think of names related to Alaska, the white that is always present in their coat, or the cold in general. Some names that fall along these lines are Kodiak, Yukon, and Lakota. Alaskan Malamutes also make strong sled dogs. Borrowing names from other sled dogs whether they be real-life or from a movie always creates good alternatives. Some of our pages will contain a subcategory. A subcategory is a slightly more specific grouping than the main topic of the page. For a subcategory, we will include a separated table of names and corresponding descriptions. An example of a subcategory of Red Dog Names would be 'Dog Names Inspired by Red Wines'. 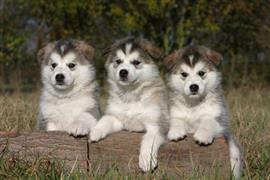 If you have any subcategory ideas for the Alaskan Malamute Names page, we would love to hear them. Use the form below to submit your ideas.